On a Wednesday evening, students, parents and teachers gathered in a nondescript office building on the edge of downtown Dallas. One by one, the students stood in front of their parents and peers as they presented ideas for their latest school project. Assigned to redevelop the rooftop of their school to incorporate outdoor classrooms and exercise space, the students offered their ideas while also applying strategies to mitigate the urban heat-island effect, capture rainwater and provide alternative energy sources. Using a large-format, interactive LCD monitor, the young designers panned and zoomed through 3-D CAD models. They explained orientation techniques to capture not only downtown views, but also prevailing winds as they showcased wind turbines and photovoltaics, and they described geometric, multi-planar canopies that create playful shade structures. Their designs were well-considered and sophisticated; their enthusiasm was genuine and infectious. These students are members of the inaugural class of CityLab High School, an innovative public school focused on architecture, urban planning, and environmental science. CityLab is the product of a grassroots effort of design professionals, educators and community advocates to create a school that represents the diversity of Dallas while utilizing the city’s core as a living laboratory. A product of Dallas ISD’s Public School Choice Initiative, led by the district’s Office of Transformation and Innovation, CityLab reflects the school system’s long-term goals to create a range of options so that students can attend a “best-fit” program that aligns with their interests and individual learning styles. Choice Schools offer the same rigorous academics of the district’s Magnet School program but use a lottery-based selection process for open enrollment, which allows for a broader demographic reach. By design, the enrollment represents 50% low-income students and 50% middle- to high-income levels, achieving the goal of socioeconomic integration. It is a true cross-section of the city, providing an environment that reflects an increasingly diverse and expanding world. 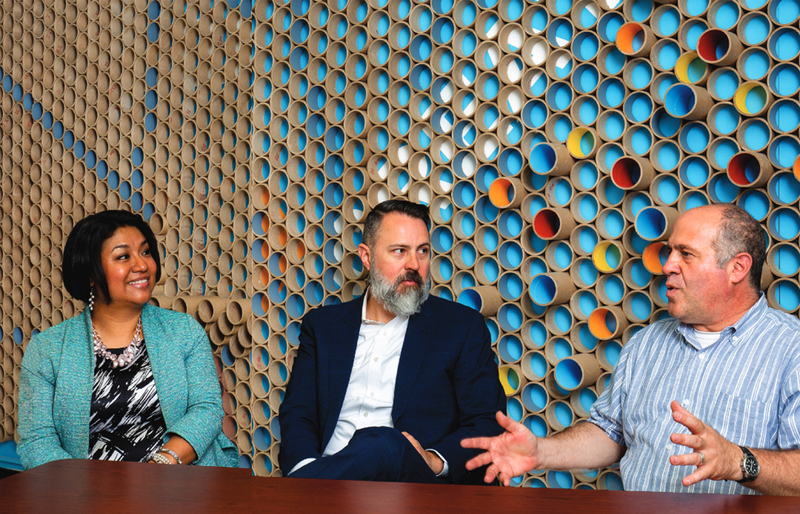 Although CityLab owes its existence to many dedicated individuals and industry leaders, it was primarily spearheaded by two local architects committed to education and mentorship. Peter Goldstein, AIA, a graduate of DISD’s Hillcrest High School, received his bachelor's degree in architecture from Tulane University and master's in architecture from Yale University. Lorena Toffer, AIA, RID, originally from Mexico City, received her bachelor of arts degree in architecture from Monterrey Tech and her master's in architecture from Texas A&M University. Both attest to the importance of academic mentors in their early careers. While at Yale, Peter was inspired by Vincent Scully [and his passion for promoting the power of art and architecture in the community. Lorena credits Emilio Alvarado Badillo, dean of Student Services at Monterrey Tech, and Guillermo Vasquez de Velasco, associate dean and director of outreach at Texas A&M, with setting her on the path to becoming an architect. Most architects enjoyed similar relationships with a mentor, either at a university or early in our professional careers. Peter and Lorena, through separate tracks, are carrying the torch forward. Peter taught in South Africa on a Fulbright scholarship, at the Boston Architectural Center, at Skyline High School, and, since 2009, has led a summer high school residency program at Fallingwater. Lorena has been recognized as an industry leader and advocate for diversity and inclusion, with accomplishments and accolades such as the 2011 AIA Dallas Young Architect of the Year, 2014 AIA National Young Architect Award, founding committee chair of the AIA Dallas Latinos in Architecture Network, and adjunct professor at the University of Texas at Arlington College of Architecture, Planning, and Public Affairs. Peter and Lorena first met while Peter was teaching architecture at Skyline. The two found themselves aligned over several years as Lorena provided mentorship to Skyline students, including coordinating a donation of architectural texts from the Latinos in Architecture Network’s annual book drive, From and Architect’s Bookshelf. Peter had been trying for years to bring a design-focused high school program to downtown Dallas. Over lunch one day in 2015, Peter pitched the idea one more time, hoping he had found a partner to help bring the idea to fruition. Lorena jumped at the opportunity. By fate or serendipity, DISD’s Office of Transformation Innovation released the RFP for the next round of Choice Public Schools a few days after that lunch meeting. The two set to work, researching similar programs from Philadelphia to Albuquerque, San Diego to Dade County, Florida. 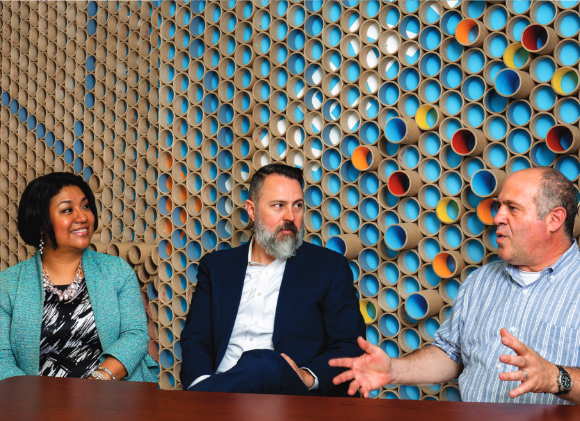 They turned to local developer Jack Mathews, local educator Carmen Casamayor-Ryan and Samuel Odamah of the Harvard Business School for advice and a multi-disciplinary perspective on the program. They received the endorsement of AIA Dallas as well as local architecture firms, both large and small, proving the industry support. Through hundreds of hours and sleepless nights, they crafted their vision of “an inner-city high school where students use the city as a lab and engage with and explore the diverse social fabric and neighborhoods of Dallas.” The proposal was submitted in December 2015 and received unanimous approval by DISD’s Board of Trustees in the spring 2016. On Aug. 28, 2017, the first students walked through the doors of CityLab High School. As a parent of one of those students, I can say that CityLab is meeting its goals and then some. This past academic year, the students have engaged with Texas Trees Foundation, the African American Museum Dallas, and the City of Dallas’ Planning and Urban Design Department. Studio critiques have involved representatives from Beck, Perkins+Will, AECOM, HKS, and others. Field trips have included measuring the heat-island effect at City Hall Plaza, examining urban recreation at Klyde Warren Park and the Ronald Kirk Bridge, discussing historic preservation with a tour of the Wilson Block Historic District and delving into concepts of urban planning via an examination of Fair Park. Students participated in Parking Day, EarthX, and AIA Dallas Retrospect. One of the highlights was a discussion with Theaster Gates, the 2018 recipient of the Nasher Prize, whose message of art, beauty, and community — that one step alone is different than walking with 100 others — perfectly aligned with CityLab’s goals. Like any grassroots startup, CityLab is a work in progress. The facilities provided by DISD will require a phased renovation over the next several years, ultimately inhabiting 120,000 square feet and five levels of that nondescript office building on the edge of downtown. With just under a year to design and complete the first phase of the finish-out, Manning Architects-Perkins Eastman focused on an open plan with abundant light and views of the Dallas skyline. Movable white board partitions define “classrooms,” and a central gathering space serves as a hub where students start each day. The 2018 class of the AIA Dallas Emerging Leaders Program worked with students and administrators on the design of studio and maker spaces. Planned future phases will add classroom space as each year adds a new class of students. The first floor will house an expanded lobby, cafeteria, fitness facilities, a maker space, and bicycle storage for the CityLab Bike Brigade. And someday, hopefully soon, there will be a vibrant rooftop garden where the dreams of CityLab’s inaugural class of urban academics are made real. John Allender, AIA, is a principal with Architexas.